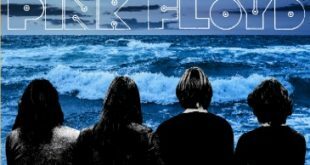 The late summer early fall of 1971 was a busy time for Pink Floyd, they had just returned from the brief Japanese and Australian tours and were working on finalizing their next wax opus, Meddle. 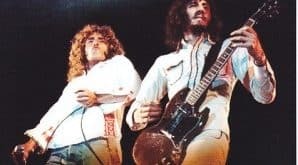 With an upcoming BBC session planned, as well as the filming for the Live In Pompeii film, the group manages to squeeze in a short string of four European dates. The fourth and last date was in the city of Copenhagen at the famed KB Hallen, a venue that held 3,000 punters for concerts. Sadly, the venue caught fire in 2011, the damage was intense and the building was demolished soon after. A unique looking venue, a straight arched building held many of the heavyweights of Rock music over its career, a couple of my favorite recordings from the KB Hallen are Led Zeppelin’s iconic May 1971 performance and Jimi Hendrix’ September 1970 concert, one of his last live dates. Pink Floyd’s concert at the KB Hallen has circulated for years and there are two known recordings that exist. What is commonly referred to as recorder 1 is the best quality, the tape is an excellent sounding document. The drums, keyboard, and vocals are prominent in the mix with Dave’s guitar slightly lower, it favors the upper frequencies and does suffer from a sometimes inconsistent mix largely due to the moving of sound thanks to the Azimuth Coordinator. 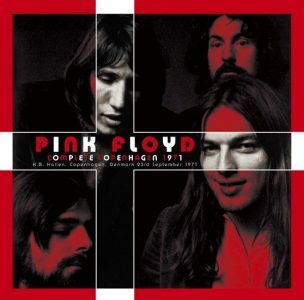 The taper also paused the tape machine between songs and the first half of Atom Heart Mother was cut due to some unknown reason, these shortcomings are few and are by far overshadowed by the crisp sound and ambiance of the recording. It has been booted a few times prior, Falkoner Theatre 25.09.71 Vol 1 & 2 (Life Live LLCD9102), Northern Old Sun (Shout To The Top STTP 164/165) and Danish Blues (Sirene-199). Recorder 2 is merely a good sounding tape, it is more distant than the first yet is nicely balanced and much more complete with virtually the whole concert being complete. All instruments and vocals are clear in the mix with just a small amount of tape hiss, the main differences is the recording equipment really made the difference. Recorder 2 has seen a few releases back in the days of vinyl, Live In Danimark (Apolinaire APR7801) and 1971 Live In Danimark (Ganesha Records), both feature the same content, a short three song fragment of the end on the concert. When this source began to freely circulate it confirmed that the running order on the recorder 1 was incorrect, Cymbaline was played later in the set, with recorder 1 being cut between songs, the obvious answer was someone rearranged the order to fit it on the media they were circulating it on, cassette or reel to reel. 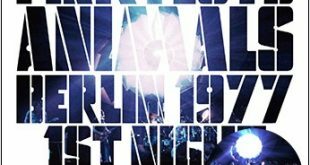 Danish Blues was released back in 2006 so this concert was in need of an upgrade, the folks at the SpeakEzy label were up to the task. This new release is a two source mix using recorder 1 as its foundation with recorder 2 filling in the gaps and as the title says, is the most complete version of the concert available. All of the songs had pauses between so those are filled as well as the last 3 minutes 15 seconds of Set The Controls For The Heart Of The Sun, the first eight minutes of Atom Heart Mother, and the first minute of A Saucerful Of Secrets. The mastering is excellent, the edits are seamless and while the sonics between the two recordings are vastly different, the changes are not at all jarring. When I throw on my copy of Danish Blues the sound is very similar, for me its really hard to say if one is superior over the other, if anything the lower frequencies in this title are just a tad cleaner making the very slight bit of distortion less noticeable and the SpeakEzy title may be a hair louder but that’s it. The performance is really good, Pink Floyd were playing with a confidence as if they knew they had a clear musical direction with the new music they were creating and soon releasing on the classic Meddle LP. They do not sound as sluggish as the Montreux gig a few days prior. I like the long intro prior to Eugene, just before the band starts a woman near the taper loudly coughs, I have wondered if she was taking a huge hit of a spliff in preparation. The rather short lived opening of Careful With That Axe, Eugene is rather nice, finally free of Green Is The Colour and the better for it. The crisp recording gives light into Roger’s detailed psychotic ramblings early in the song. The Rhythmic jam in Fat Old Sun is superb, Wright seems to be playing lead making for strong renditions of the piece, shortly before its retirement. 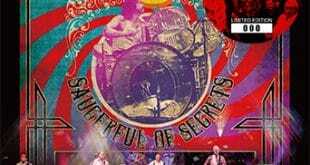 Nice to have a complete A Saucerful Of Secrets as well, the clarity of the recording and Nick’s drums being perfect in the mix make this a particularly enjoyable version. Since there was a bit of extra time, as a bonus SpeakEzy puts the recorder 2 version of Set The Controls For The Heart Of The Sun at the end of the second disc. Always a favorite of mine, the quiet and respectful Danish crowd is listening as intently as I am. The packaging is full color inserts with adorned with posed and live shots of the group. The front cover opens up to reveal a shot of the KB Hallen and the inner cover is a take on the old Live Life cover. The mastering is excellent as is the overall sound quality and when coupled with a great performance makes for a very nice, and welcomed, release from SpeakEzy, well done!